The thoracic aorta is situated inside the posterior mediastinal cavity, and has a radius that measures about 1.16 centimeters. 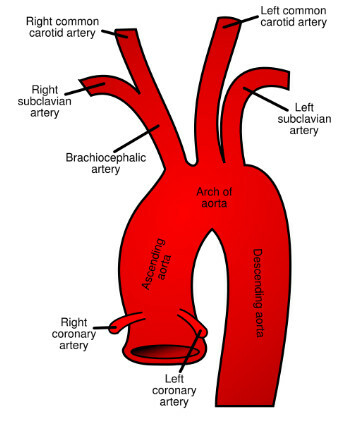 From the thoracic cavity to the diaphragm, the aorta’s thoracic section continues the aortic arch. The blood supply maintained by aortic arch’s numerous branches is benefited by the organs and muscles situated in the thoracic region. Heart - The heart is supplied with blood by the pericardium together with the pericardial arteries. Lungs - it is the bronchial arteries which gives the lungs the blood that it need. Esophagus - esophageal arteries provide the blood supply it needs which passes through mediastinum. Thorax wall and intercostal arteries - it is the segmental posterior intercostal arteries that provide blood supply to the thorax wall and the intercostal muscles. Diaphragm- the one meeting the blood supply needs of the diaphragm is the phrenic arteries.